High pressure reducer for gaseous fluids, butane gas, propane, natural gas and compressed air (and their mixture). This reduce can be used as 1st stage regulator. 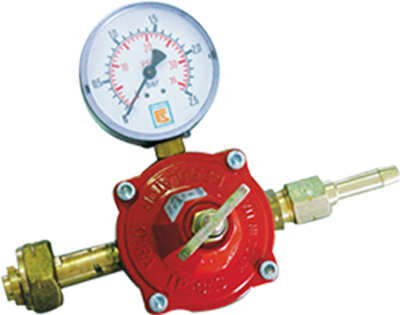 This product is predisposed for gauge and safety valve (or they are already assembled). The reducer comes with screw adjustment and locking nut. Adjustment possibilities: 0 ÷ 4 bar or 0 ÷ 6 bar depending on the model. Body: in brass according to European law EN 12165 CW617. Cover: in zamac according to European law EN 3718. Membrane: in approved NBR rubber according to European law EN 559, reinforce with polyester cloth.